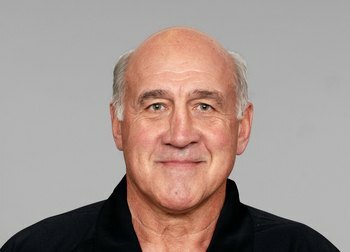 Michigan, in an effort to have the oldest coaching staff in the country and lure recruits with offers of Werther's Caramels, has hired Baltimore Ravens defensive coordinator Greg Mattison to lead the much maligned Wolverines defense. By now, you probably know his history: Mattison served as Michigan's defensive line coach and defensive coordinator from 1992-1996 before shipping off to Notre Dame and Florida, and then finally to the NFL to lead one of the fiercest defenses in the league. Mattison was already firmly entrenched at Notre Dame before 1999, the earliest year that I can find stats for. He took over the defensive coordinator position in 1997 and served until 2001. From 2002 to 2004 (in blue), Mattison served solely as the defensive line coach for the Fighting Irish. Toward the end of Mattison's reign as the defensive coordinator, Notre Dame's defense was shaping into something fierce. If the defensive progression is uniform over his first two years (that we don't have stats for) it's safe to say that Mattison took over a fairly defunct defensive unit and took only a few years to morph it into a solid group. The exciting data point here is the rushing defense when Mattison took over as defensive line coach. In his first year as DL coach, Notre Dame's rushing defense jumped into the top 10 nationally and had only a slight speed bump in his second year before returning to a top-five unit in 2004. In contrast to Brady Hoke's performances, these numbers show a coach that has crafted a defense (or defensive line as it may be) into a top-notch unit. Hoke struggled for years to develop a quality defense and maintain that production, but Mattison seems able to do so in relatively little time. From Notre Dame, Mattison went to Florida where he served alongside Charlie Strong as co-defensive coordinator. Mattison served as the Florida defensive coordinator between 2005 and 2007 (in blue). All three years, Mattison was listed as co-defensive coordinator and defensive line coach. Like his last gig, when he took over the defensive line, it quickly turned into a top-10 unit. Mattison took a middle-of-the-road rushing defense in 2004 and immediately turned them into a dominating group. Part of that comes on the strength of a few incredible recruiting classes (about which more later), but for the most part, Mattison turned Florida's defense into an unquestioned power. The Baltimore defense's reputation precedes it, and if you didn't already know that it's one of the stingiest in the NFL, you haven't watched a single NFL game in the last 10 years. While I don't want to read too much into NFL production because it's not necessarily an indicator of college success, this is just more evidence that Mattison's defenses are routinely great. Not all of Mattison's success can be attributed to his schemes, necessarily, especially at Florida where a number of legendary recruiting classes helped the Gators to an unbelievable run in the '00s. Mattison's haul in 2006 includes four 4-stars, a 3-star, and a little known 5-star recruit named Tim Tebow. In 2007 (the only other year that Rivals has a record of his commitments), Mattison brought in two 4-stars, a 3-star, and another 5-star. This isn't meant to take away from Mattison's schemes, but rather highlight that he's not only a good schmatic coach, but he also appears to have some recruiting chops. And that was before he was able to tell recruits he was in charge of one of the best defenses in the NFL. On paper, Mattison looks like a great hire. Unfortunately, he has one obvious flaw: He's 60 years old. This is yet another coach under Hoke's command that is nearing retirement age. It's hard not to look at the staff that Hoke is compiling and not think that it's being built only to be uniformly scrapped in three to five years. In the immediate future, this will appease the masses, but the sustainability of these coaches is slim at best. But that's something I'll complain about when Michigan has to replace them. For now, if Mattison can repeat the performances his resume is filled with, Michigan should be in good shape in the coming years. "Hoke struggled for years to develop a quality defense and maintain that production, but Mattison seems able to do so in relatively little time." Can't ignore personnel - Hoke had Ball State players while Mattison had Notre Dame players. I'm not even a huge Hoke proponent. I think Rodriguez is a better coach. I'm just saying his resume isn't as bad as people are making it out to be. Maybe he doesn't "deserve" the Michigan job based on resume, but as MWC coach of the year, he probably deserves a BCS job somewhere. His ties to Michigan and passion for it do count for something. Hoke is unproven as a BCS coach, obviously. But he's significantly improved the 2 places he's been and we all hope he can make it 3. The concern with Mattison, IMO, is how he'll do without elite personnel. While M's defense should be dramatically improved, the talent and experience mix on the roster are only average for the Big10. At Baltimore, Florida, Notre Dame, and Michigan (in the 90s) Mattison had a decided advantage in personnel. How much of his success is due to scheme and play calling remains TBD? If Mattison can get this D into above average production, I'll be very impressed. The exciting bit about Mattison (besides the long resume) is that he has an excellent reputation for player development and recruiting. He's a great hire to get the defensive coaching pointed in the right direction. Your point about staff age is a good one, but for what Hoke's trying to do, I think its OK.
Hoke wants to reestablish an identity. Established coaches who he can trust to develop what he wants are not a bad idea. For Mattison this is his last job and he knows it. Whether he's here for 3 years or 5 - it doesn't matter. If he can get Michigan "back to being Michigan" like Hoke wants, then hand over the reigns to an assistant, we'll all be happy. Thats why I'm very interested to see who the next couple of assistant coaches are. I'd like to see a younger "DC in waiting" type, rather than another one of Hoke's buddies with a meh resume. Someone who can learn from Mattison and then fill his shoes. "Can't ignore personnel - Hoke had Ball State players while Mattison had Notre Dame players." This is a little problematic: Hoke had BSU personnel but he also had BSU's schedule (against similar talent levels). Hoke's resume, especially for his first few years at BSU, is the biggest strike against him. It's bad, and there's no way to argue about it. Your point about Mattison's Ravens personnel is noted though. I thought about mentioning that Michigan doesn't have Ray Lewis etc., but as I said above, I don't want to read too much into his NFL success. Its safe to say that, even with early season MACrifice games and ND's service academy fetish, Notre Dame plays a much more difficult schedule than Ball State. My point was that ND had a talent advantage nearly every game it played. Ball State had a talent disadvantage, especially in the early seasons before Hoke could establish his influence on the program. I don't think anyone is arguing Hoke is a brilliant strategist or defensive mind. His purported strengths are managing a program, recruiting, and his overall passion/intensity/personality. It makes sense this would take a few years to kick-in at Ball State. Got it, that makes more sense. Though I still don't know (I haven't looked at the numbers) that you can argue that BSU was playing at a noticeable talent deficiency with respect to its conference opponents. It's too much work to investigate, though.